The Kearny Marsh is contaminated due to current and historical inputs of landfill leachate, combined sewer overflows, and municipal stormwater discharges. 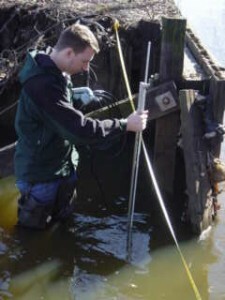 The current hydrologic conditions of the marsh are the result of human alterations including municipal stormwater inputs from the Town of Kearny, creation of mosquito drainage ditches through the marsh, and channeling of marsh drainage to a partially clogged 60″ pipe in the Belleville Turnpike/ NJ Turnpike northeast corner of site. Due to the surrounding urban land use and the adjacent Keegan Landfill, significant impacts are suspected from groundwater and surface water interactions and discharges from storm drains into the marsh. Specific objectives of the research are to determine Kearny Marsh groundwater and surface water hydrology and current contaminant loads to the marsh via these inputs. This water quality study will evaluate the stormwater and groundwater inputs to the Kearny Marsh and provide data that can be used to identify pollutant sources to the Marsh. 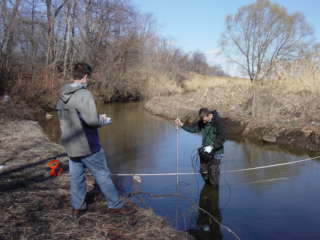 From this data Rutgers will develop, calibrate, and field verify a water quantity and quality model for the Kearny Marsh wetland system. The water quality model will include projected annual contaminant inputs for priority pollutants including heavy metals, PAHs, and PCBs. The study will provide information essential for future restoration and management of this valuable resource.